Tag Archive | "Zebra oto"
The Zebra Otocinclus (Otocinclus cocama) is one of the smallest catfish in the Loricariidae family and is a voracious algae eating machine. Named for the Cocama-Cocamilla Indian tribes that used to be dominant in the lower Ucayali and lower Marañon region of Peru, Otocinclus cocama is also referred to as the Tiger oto or Zebra oto by tropical fish keeping enthusiasts. The Zebra or Tiger oto (Otocinclus cocama) was originally discovered in a tributary of the Rio Ucayali in Peru. The fish is found in small to mid size tributaries and in the slow flowing marginal zones of larger rivers, clear water creeks of the Ucayali River and possibly the Marañón River. They occur in large numbers in areas with aquatic vegetation or grasses growning in the water, usually near the surface among the vegetation in the upper part of the water column. The Zebra oto has the same general body shape as other Otocinclus species. They are all small, have sucker mouths, and armored bodies. The Zebra oto can be distinguished from other members of Otocinclus by its blotchy vertical stripes and its complete lateral line. The Zebra oto has the most number of teeth of any species of Otocinclus, and except for Otocinclus batmani, the “W” looking mark on its caudal fin distinguishes the Zebra oto from all other species of Otocinclus. The Zebra Otocinclus Catfish is an attractive and useful addition to any freshwater aquarium. 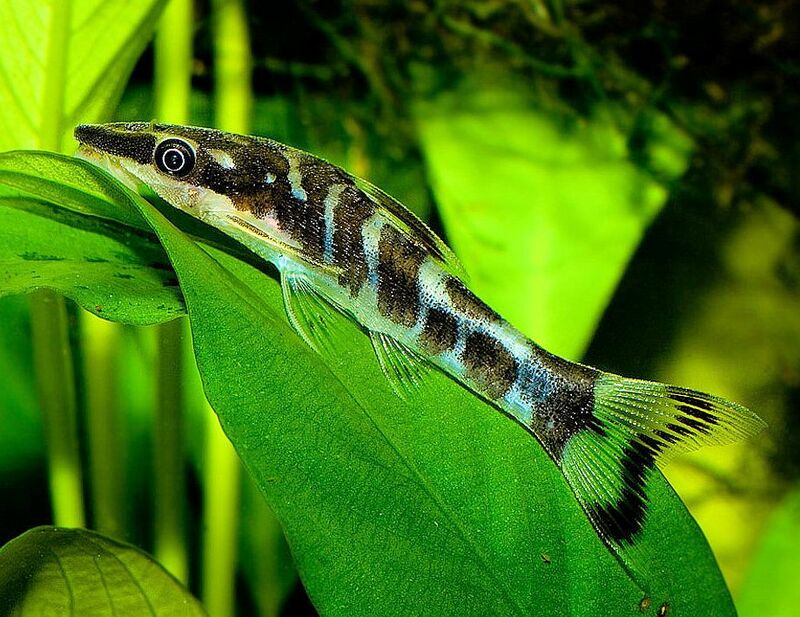 Because they come from fast moving rivers and creeks in Peru; the Zebra Otocinclus Catfish should be housed in at least a 30 gallon aquarium with good filtration, good water movement, and moderate aeration. They do well in a densely planted community aquarium with rocks and driftwood to give them plenty of hiding places from other fish. Dried leaf litter is sometimes added to the tank for the fish to graze on as it decomposes. Although Zebra otos are peaceful with other species, they do not make an ideal community fish due to their small size and rather timid nature. Ideally they should be kept alone in small groups, with other small non aggressive tetras, smaller loricariid catfishes, or with freshwater shrimp. The Zebra Otocinclus Catfish is a very peaceful and social species that prefers being kept in small schools of at least 6 specimens. Place five or six Zebra Cats together in an algae coated aquarium and in a few weeks you will be able to see through the glass. In a few months it will be spotless. They should never be placed in an immature aquarium. If algae is not present in your tank, the Zebra Oto’s diet must be supplemented with a vegetable-based flake food or sinking algae wafers. The Zebra oto grows to a max length of about 1.7″ but males are smaller.